SNES Mega Man X (USA) in 29:08.45 by nrg_zam. 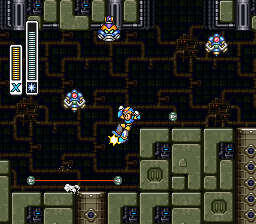 Since moving to the SNES 16-bit land, Mega Man has taken the secret identity X, but everyone knows it's still him because he's the only blue robot who shoots three pellets at a time at other robots and steals their weapons. Thanks to a newly discovered trick (namely turnaround kicks) along with further optimisations, nrg_zam cuts off 4.46 seconds over the previously published TAS. For more details on turnaround kicks, read the author's comments. For extra curiosity, there is a page "Mega Man X Tricks" that explains some of the tricks that are and/or can be used in the X series games. If you want to see more of the blue-clad hero, we recommend watching the 100% completion run.